A series of Valley Lutheran students showed a glimpse of their bright futures, even if taking advantage of that one day means you’re probably having a bad day. 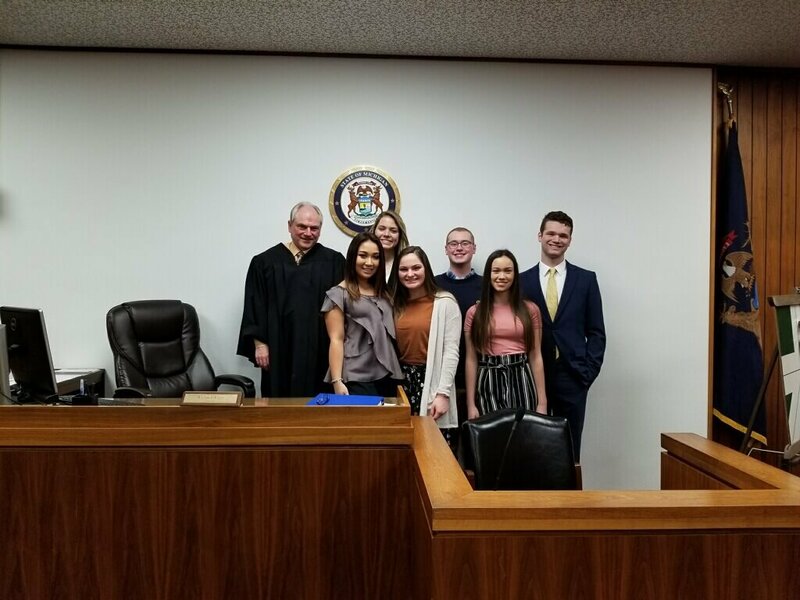 Twelve Valley students took part in Saginaw County Law Day on Thursday, March 21 trying a fictional case in front of an actual magistrate at the Saginaw County courthouse. In the fictional case, a Valley student played the part of a teenager who was texting and driving in a construction zone. He swerved to miss an oncoming vehicle striking and killing a construction worker. Marotzke and Katie Wilson played the part of lawyers with Andy Fritz serving as the defendant. Kelsey Vittitow, Abi Walk, and Megan Mattichak served as witnesses. If you have information about a Valley student, staff member, or alumni that is news worthy, please share with us at news@vlhs.com. Magistrate Richard Alger Jr. presided over the day, which included 20 schools playing the role of prosecutors and defense attorneys in the same case 10 times. Valley was 1 of 2 schools to return a not-guilty verdict. Carson Hundley, David Jahnke, Nathaniel Mueller, Valerie White, Anna Katenhus, and Allison Lemanski, attended to serve as jurors in one of the other cases. Students from Freeland High School served as jurors in Valley’s case. Meyers said the group spent six weeks preparing for the case, including visiting with attorneys Darrell Zolton (VL ‘80) and Eric Dalek to polish up the details of the team’s case, as well as to learn proper procedure. The Saginaw County Bar Association put on a lunch for the participants at First Presbyterian Church following the day’s conclusion.